The winner of the spring 2018 C. Henry Smith Oratorical Contest at Eastern Mennonite University has placed second at the contest’s final, bi-national level. 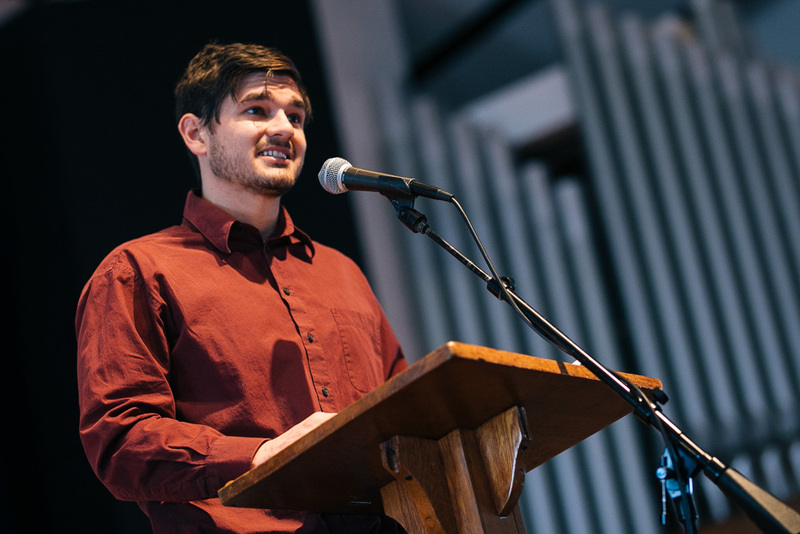 Caleb Schrock Hurst, currently in Vietnam for a year-long service placement with the Mennonite Central Committee (MCC) program Serving and Learning Together, spoke on “‘Is This a Bonhoeffer Moment?’: Asking the Right Questions in Trump’s America.” His speech – and the others presented at EMU last spring – can be heard here. The intercollegiate competition offers students an opportunity to discuss the application of the Christian peace position to contemporary concerns in an 8-10-minute speech. It is administered by the Peace and Justice Ministries of MCC. C. Henry Smith was an American Mennonite historian and professor at Mennonite colleges and the University of Chicago. He taught history for nearly 50 years at the collegiate level, and was well-known for his numerous books on Mennonite history and his particular attention to the peace commitments of the Mennonite tradition. EMU has participated in the event since 2003, with the exception of 2015. EMU students have won the grand prize at the bi-national level in 2003, 2004, 2007, 2009 and 2011. The contest is sponsored by EMU Bible and religion, language and literature, and peacebuilding and development programs.